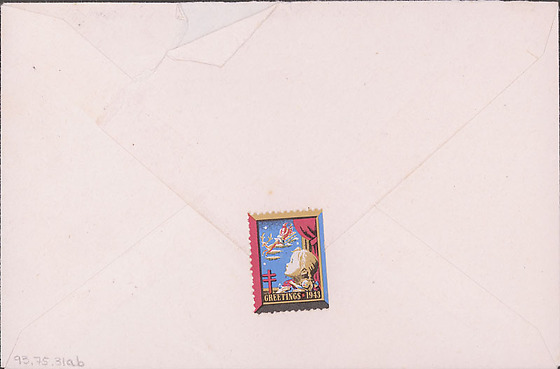 1 letter and envelope from Tetsuzo (Ted) Hirasaki to Clara Breed. 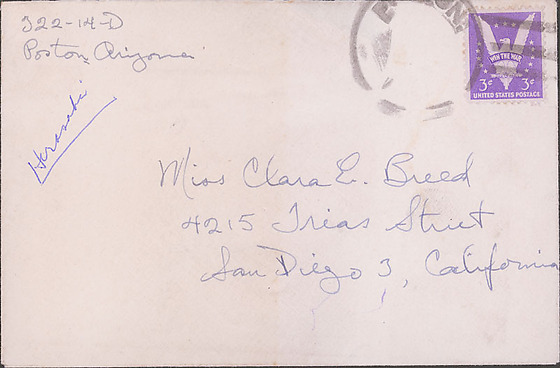 322-14-D / Poston, Arizona / December 29, 1943 / Dear Miss Breed, / A rather belated Season's Greetings. / Thank you ever so much for the gifts. It certainly is a treat to receive such rare items---, especially the Hershey Bar! 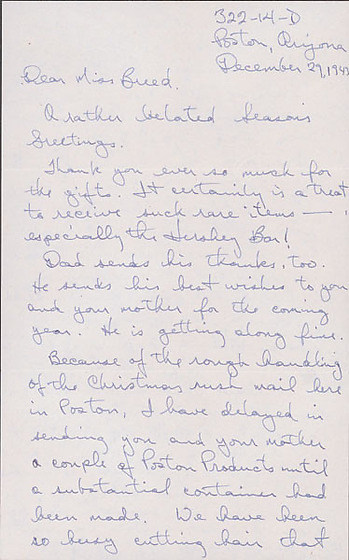 / Dad sends his thanks, too. He sends his best wishes to you and your mother for the coming year. He is getting along fine. / Because of the rough handling of the Christmas rush mail here in Poston, I have delayed in sending you and your mother a couple of Poston Products until a substantial container had been made. We have been so busy cutting hair that that is all we have time for during the day. Everyone wants to look his best for the New Year. / I am again attending shorthand class at night and with homework to do, I am quite busy. Especially when I am trying to catch up with the sleep lost at Tule Lake. 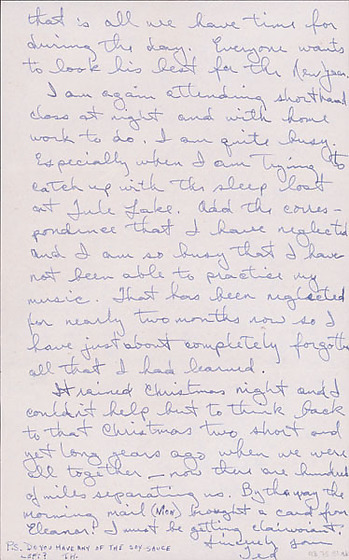 Add the that I have neglected and I am so busy that I have not been able to practice my music. That has been neglected for nearly two months now so I have just about completely forgotten all that I had learned. / It rained Christmas night and I couldn't help but to think back to that Christmas two short and yet long years ago when we were all together--now there are hundreds of miles separating us. By the way the morning mail (MON) brought a card from Eleanor! I must be getting clairvoiant. Sincerely yours / Ted / P.S. Do you have any of the soy sauce left? TH.